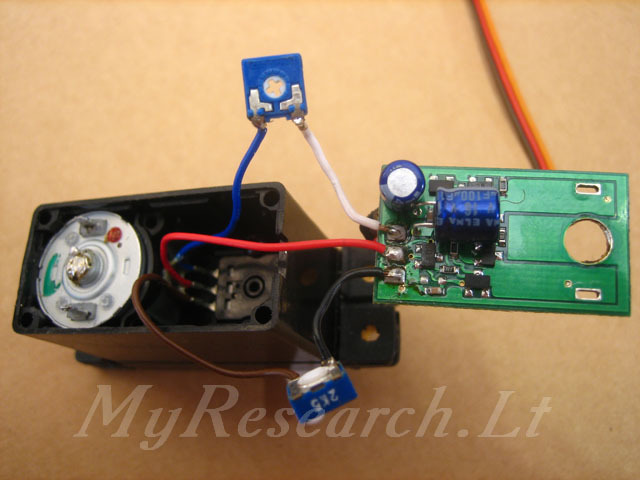 d) to install two extra electric resistors in the servo-mechanism. The order of installation of the extra resistors. 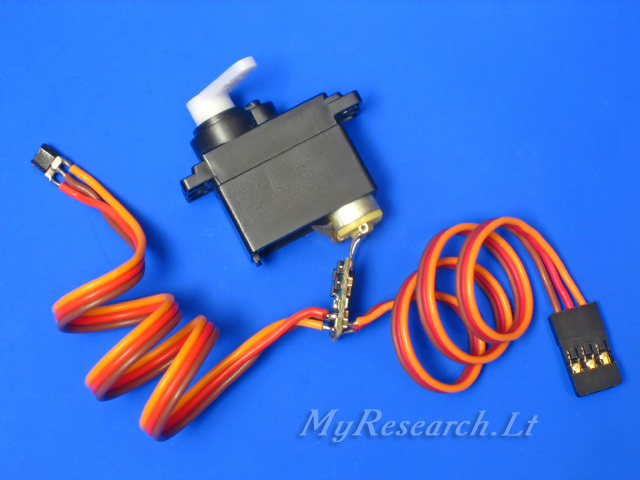 Take the servo-mechanism (either analogous or digital one - it does not matter) and, without connecting it to the receiver, turn the arm manually. It is necessary to get convinced that the necessary magnitude of deviation is mechanically possible. Then remove the lower cover of the servo-mechanism. 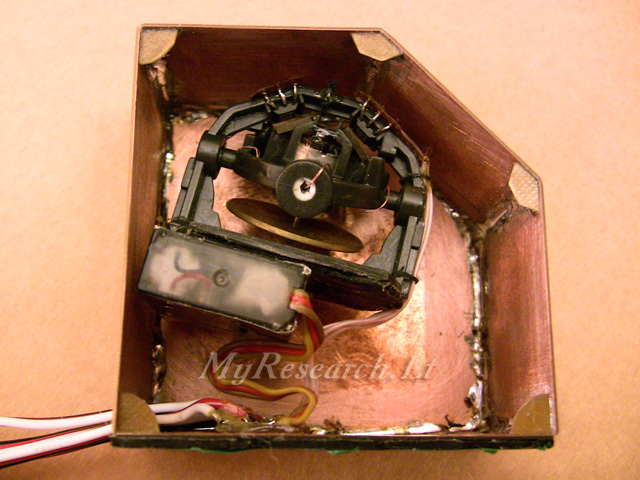 The electronic scheme inside is connected with the motor and the potentiometer. Three wires come out of the potentiometer: two wires - on each side and one - in the middle. The wires, coming out of the lateral contacts, must be slit. 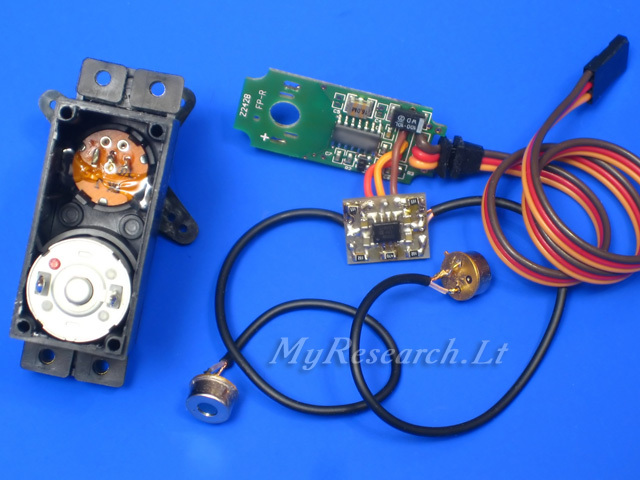 Seeking for rotation of the servo-mechanism, which secures deviation for 120 degrees, for 180 degrees, it is necessary to install the resistors, equal to 25% of resistance of the potentiometer, between the slit ends of the wires. If the magnitude of resistance of the potentiometer is not indicated on it, the magnitude can be measured by connecting the tester to two slit wires. Usually the potentiometers for 5 or 10 kOhms are installed in the servo-mechanisms. The extreme positions of the swing can be regulated by installing the diminutive potentiometers instead of the constant resistors. The view reflects the standard servo-mechanism out of the set of the equipment SPECTRUM. Resistance of the potentiometer is 5 kOhms; two extra potentiometers (2,5 kOhms each) are installed; the maximal deviation makes approximately 200 degrees (+-100). It is also possible to install constant resistors, resistance of each of which will make approximately 30-35% of the value of resistance of the potentiometer of the servo. In this case the servo will be set against the mechanical limiter and it will be necessary to restrict motion of the servo in the menu of the control panel. d) to assemble the servo-mechanism. Now the servo-mechanism will rotate around according to the control signal, without returning into the primary position. 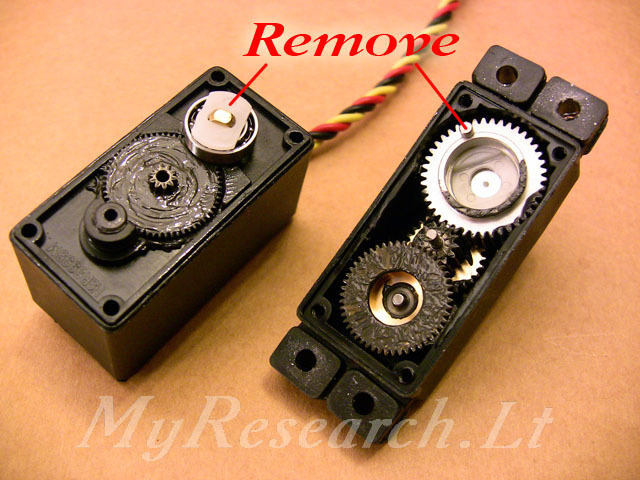 The photo reflects the gear with the restrictive ledge, which must be pulled out, and the insert, connecting the mechanism with the potentiometer, which must be removed. 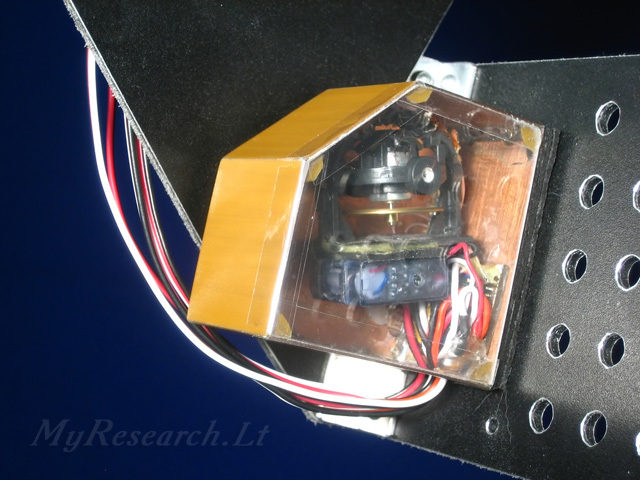 IR photocells are fixed on the movable part of the controlled gimbal of the camera or on the opposite ends of the controlled model. A signal of the sensor is applied to an ordinary servomechanism instead of the internal potentiometer. The potentiometer of the servomechanism is connected to the negative terminal, to the reference voltage and has one output (3 conductors); the infrared sensor is connected in the same way.